It's mid May already and i just couldn't believe time flies super fast!! I've been pretty busy for internship lately, and not forgetting to mention i have to do this final project for my last year and a little bit helping here and there. But finally i managed to take another OOTD photos!! Another idea comes from www.whowhatwear.com about this 30 Ways To Upgrade Your Style This Spring, as you probably know i did around 15 challenges for the previous winter challenge here. These days, i am just admiring lots of dresses, and skirts as the weather is pretty nice and windy and awesome. Definitely perfect for a swing with your dearest skirts. Aside from giving you this sweet and classy look, a skirt could actually be a life-saver to look better, especially if you are having the coolest skirt trends. 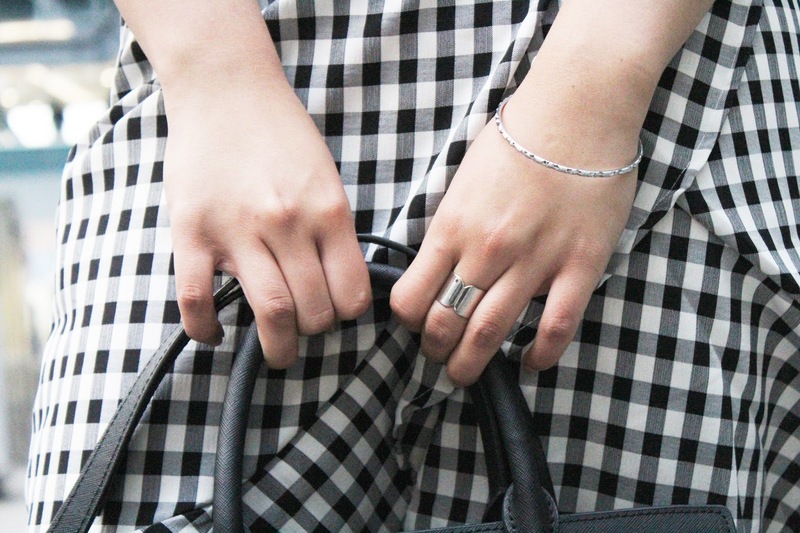 In this case, let's try this gingham ruffled skirt. 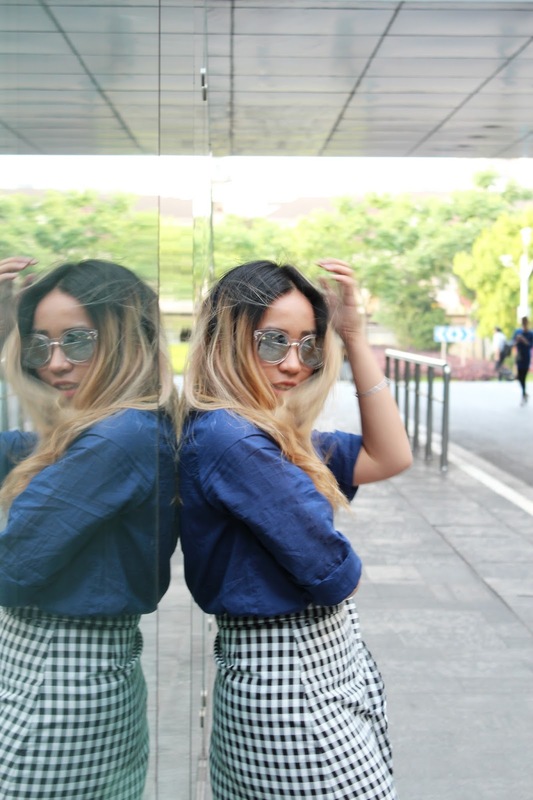 This gingham skirt piece is such a perfect pair for an office look! Of course to pair this with a plain shirt, and some black gold heels that will create this formal look. Apart from the heels, some sparkle of silver accessories would really bring this whole outfit to the next level. Silver ring, simple line bracelet, pearl straight earrings, and this cool aviator that i've been obsessed with lately. I just adore the shape of this frame and the actual glasses itself. 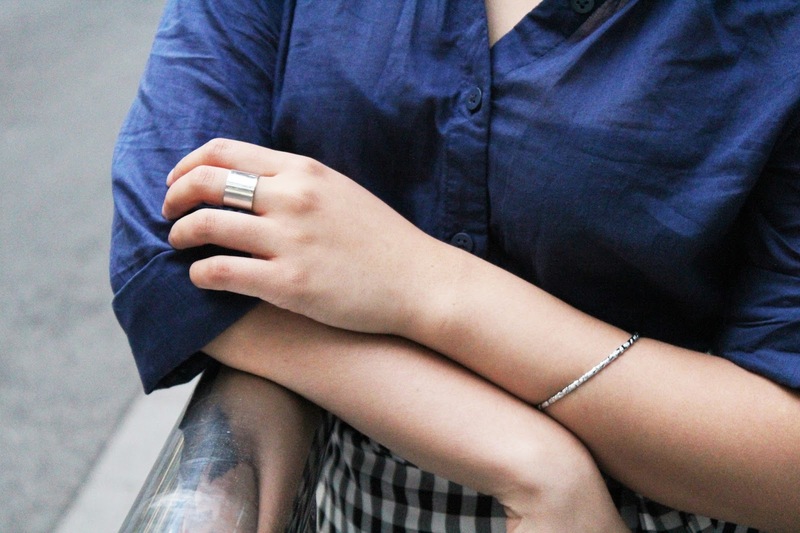 It gives a cool yet edgy touch on whoever's wearing it. Another thing that i love from the skirt was it allows you to style the skirt yourself. Because actually it is a wrapped skirt, meaning you can wrap it around your waist and decided whether you would put the ruffled side on the left or on the right, even on the back! This time, i made the ribbon on the left side, as to align the ruffled edges and i think it turned out pretty cute. Plus, i am using my favorite shirt from H&M, since it's super thin and i just fell in love with the color all over again, it perfectly suits for sunny days like this. But one of the drawback was it's just super easy to crumple, which is annoying when you wanted to take perfect shot of photos like this. But however, i am glad i have this. It's just another part of my #WWWspring30 challenge and see you guys next time !! PS : details are shown below at the end in the photos !